Color(s): any color of brown, sedge, or dead grass. Having developed in the United States Chesapeake Bay Area during the 19th century, this breed is also known as Chessie, CBR or Chesapeake. This breed was the first retriever breed to be recognized by the American Kennel Club but unfortunately it is not as popular as Golden Retriever or Labrador Retriever anymore. They still are a superb family and field companion, and were previously used to retrieve water fowl. 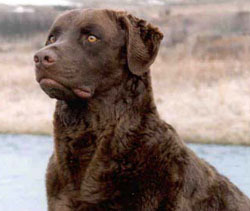 The Chesapeake Bay Retriever is prone to a number of diseases such as elbow dysplasia, hip dysplasia, Von Willebrands Disease, Progressive Retinal Atropy, cataracts and Alopecia. Their life expectancy is 10 to 12 years.